Fannie Mae reported that the Single-Family Serious Delinquency rate declined to 0.99% in August, from 1.00% in July. The serious delinquency rate is down from 1.24% in August 2016. By vintage, for loans made in 2004 or earlier (4% of portfolio), 2.65% are seriously delinquent. For loans made in 2005 through 2008 (7% of portfolio), 5.71% are seriously delinquent, For recent loans, originated in 2009 through 2017 (89% of portfolio), only 0.32% are seriously delinquent. So Fannie is still working through poor performing loans from the bubble years. • At 8:30 AM ET, Personal Income and Outlays for August. The consensus is for a 0.3% increase in personal income, and for a 0.1% increase in personal spending. And for the Core PCE price index to increase 0.2%. • Early, Reis Q3 2017 Office Survey of rents and vacancy rates. • At 9:45 AM, Chicago Purchasing Managers Index for September. The consensus is for a reading of 58.6, down from 58.9 in August. • At 10:00 AM: University of Michigan's Consumer sentiment index (final for September). The consensus is for a reading of 97.2, unchanged from the preliminary reading 97.6. As part of the new home sales report released on Tuesday, the Census Bureau reported the number of homes sold by price and the average and median prices. From the Census Bureau: "The median sales price of new houses sold in August 2017 was $300,200. The average sales price was $368,100." The following graph shows the median and average new home prices. During the housing bust, the builders had to build smaller and less expensive homes to compete with all the distressed sales. When housing started to recovery - with limited finished lots in recovering areas - builders moved to higher price points to maximize profits. The average price in August 2017 was $368,100, and the median price was $300,200. Both are above the bubble high (this is due to both a change in mix and rising prices). The second graph shows the percent of new homes sold by price. About 4% of new homes sold were under $150K in August 2017. This is about the same as in August 2016, but down from 30% in 2002. In general, the under $150K bracket is going away. The $400K+ bracket has increased significantly. I'll break that bracket up in the future. A majority of new homes, in the U.S., are in the $200K to $400K range. • At 8:30 AM ET, The initial weekly unemployment claims report will be released. The consensus is for 270 thousand initial claims, up from 259 thousand the previous week. • Also at 8:30 AM, Gross Domestic Product, 2nd quarter 2017 (Third estimate). The consensus is that real GDP increased 3.1% annualized in Q2, up from second estimate of 3.0%. • At 11:00 AM, the Kansas City Fed manufacturing survey for September This is the last of the regional Fed surveys for September. Zillow Forecast: "August Case-Shiller Forecast: Annual Home-Price Gains Aiming Higher"
The Case-Shiller U.S. National Index is expected to continue its upward climb in August, gaining 6.0 percent year-over-year following a 5.9 percent increase in July. The monthly gain is forecast at 0.4 percent, slightly below the 0.5 percent uptick in July. The 10- and 20-city indices are expected to post annual gains of 5.3 percent and 5.9 percent, respectively — both climbing a hair faster than they did year-over-year in July. And both are forecast to post monthly gains of 0.3 percent in August. Below is Zillow’s full forecast for August Case-Shiller data. 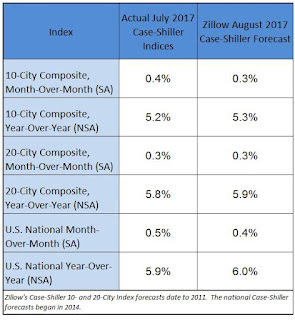 These forecasts are based on today’s June Case-Shiller data release and the August 2017 Zillow Home Value Index. The August S&P CoreLogic Case-Shiller Indices will not be released officially until Tuesday, October 31. The year-over-year change for the Case-Shiller National index will probably be slightly larger in August than in July. Freddie Mac reported that the Single-Family serious delinquency rate in August was at 0.84%, down from 0.85% in July. Freddie's rate is down from 1.03% in August 2016. This is the lowest serious delinquency rate since April 2008. Although the rate is still generally declining, the rate of decline has slowed. The Pending Home Sales Index, a forward-looking indicator based on contract signings, retreated 2.6 percent to 106.3 in August from 109.1 in July. The index is now at its lowest reading since January 2016 (106.1), is 2.6 percent below a year ago, and has fallen on an annual basis in four of the past five months. This was below expectations of a 0.1% decrease for this index. Note: Contract signings usually lead sales by about 45 to 60 days, so this would usually be for closed sales in September and October. Mortgage applications decreased 0.5 percent from one week earlier, according to data from the Mortgage Bankers Association’s (MBA) Weekly Mortgage Applications Survey for the week ending September 22, 2017. The average contract interest rate for 30-year fixed-rate mortgages with conforming loan balances ($424,100 or less) increased to 4.04 percent from 4.03 percent, with points remaining unchanged at 0.40 (including the origination fee) for 80 percent loan-to-value ratio (LTV) loans. • At 8:30 AM, Durable Goods Orders for August from the Census Bureau. The consensus is for a 1.5% increase in durable goods orders. • At 10:00 AM, Pending Home Sales Index for August. The consensus is for a 0.1% decrease in the index. It has been more than ten years since the bubble peak. In the Case-Shiller release this morning, the seasonally adjusted National Index (SA), was reported as being 3.8% above the previous bubble peak. However, in real terms, the National index (SA) is still about 13.3% below the bubble peak. The year-over-year increase in prices is mostly moving sideways now in the 5% to 6% range. In July, the index was up 5.9% YoY. The first graph shows the monthly Case-Shiller National Index SA, and the monthly Case-Shiller Composite 20 SA (through July) in nominal terms as reported. In real terms, house prices are back to early-to-mid 2004 levels. On a price-to-rent basis, the Case-Shiller National index is back to November 2003 levels, and the Composite 20 index is back to August 2003 levels. In real terms, prices are back to early-to-mid 2004 levels, and the price-to-rent ratio is back to 2003 - and the price-to-rent ratio maybe moving a little more sideways now. Yellen: "Inflation, Uncertainty, and Monetary Policy"
Today I will discuss uncertainty and monetary policy, particularly as it relates to recent inflation developments. Because changes in interest rates influence economic activity and inflation with a substantial lag, the Federal Open Market Committee (FOMC) sets monetary policy with an eye to its effects on the outlook for the economy. But the outlook is subject to considerable uncertainty from multiple sources, and dealing with these uncertainties is an important feature of policymaking. Key among current uncertainties are the forces driving inflation, which has remained low in recent years despite substantial improvement in labor market conditions. As I will discuss, this low inflation likely reflects factors whose influence should fade over time. But as I will also discuss, many uncertainties attend this assessment, and downward pressures on inflation could prove to be unexpectedly persistent. My colleagues and I may have misjudged the strength of the labor market, the degree to which longer-run inflation expectations are consistent with our inflation objective, or even the fundamental forces driving inflation. In interpreting incoming data, we will need to stay alert to these possibilities and, in light of incoming information, adjust our views about inflation, the overall economy, and the stance of monetary policy best suited to promoting maximum employment and price stability. To conclude, standard empirical analyses support the FOMC's outlook that, with gradual adjustments in monetary policy, inflation will stabilize at around the FOMC's 2 percent objective over the next few years, accompanied by some further strengthening in labor market conditions. But the outlook is uncertain, reflecting, among other things, the inherent imprecision in our estimates of labor utilization, inflation expectations, and other factors. As a result, we will need to carefully monitor the incoming data and, as warranted, adjust our assessments of the outlook and the appropriate stance of monetary policy. But in making these adjustments, our longer-run objectives will remain unchanged--to promote maximum employment and 2 percent inflation. Yellen still thinks inflation will pick up, and that the FOMC is on the correct course. New home sales for August were reported at 560,000 on a seasonally adjusted annual rate basis (SAAR). This was below the consensus forecast, and the three previous months combined were revised down. However there was probably some negative impact from hurricane Harvey (not clear the size of the impact). Sales were down 1.2% year-over-year in August. Earlier: New Home Sales decrease to 560,000 Annual Rate in August. This graph shows new home sales for 2016 and 2017 by month (Seasonally Adjusted Annual Rate). Sales were down 1.2% year-over-year in August. For the first eight months of 2017, new home sales are up 7.5% compared to the same period in 2016. This was a solid year-over-year increase through August. The "distressing gap" graph shows existing home sales (left axis) and new home sales (right axis) through August 2017. This graph starts in 1994, but the relationship had been fairly steady back to the '60s. Reis reported that the apartment vacancy rate was at 4.5% in Q3 2017, up from 4.4% in Q2, and up from 4.1% in Q3 2016. This is the highest vacancy rate since Q4 2012 (although the increase has been small). The vacancy rate peaked at 8.0% at the end of 2009. The apartment market continued to withstand the pressure from added supply in the third quarter as the national vacancy rate increased only 10 basis points to 4.5% in the quarter. With so much construction underway, vacancy rates were thought to grow higher. More importantly, asking rents increased 1.0% in the third quarter, while effective rents grew 0.9%. Total inventory is still expected to increase significantly in 2017 and 2018; however, construction in the third quarter, 47,271 units, was again lower than expected. That said, this number should be revised once things get settled in Florida and Houston – two areas that have seen significant construction this year. At 4.5%, the national vacancy rate increased 10 basis points from 4.4% in the second quarter. One year ago, the vacancy rate was 4.1%. Occupancy growth, or net absorption, was 31,352 units, lower than new supply. This pushed the vacancy rate up in the quarter. The vacancy rate had been mostly moving sideways for the last few years. However it appears the vacancy rate has bottomed and is starting to increase. With more supply coming on line later this year and next - and less favorable demographics - the vacancy rate will probably continue to increase slowly. The Census Bureau reports New Home Sales in August were at a seasonally adjusted annual rate (SAAR) of 560 thousand. The previous three months combined were revised down. "Sales of new single-family houses in August 2017 were at a seasonally adjusted annual rate of 560,000, according to estimates released jointly today by the U.S. Census Bureau and the Department of Housing and Urban Development. This is 3.4 percent below the revised July rate of 580,000 and is 1.2 percent below the August 2016 estimate of 567,000. " The months of supply increased in August to 6.1 months from 5.7 month in July. This is at the top of the normal range (less than 6 months supply is normal). "The seasonally-adjusted estimate of new houses for sale at the end of August was 284,000. This represents a supply of 6.1 months at the current sales rate." In August 2017 (red column), 45 thousand new homes were sold (NSA). Last year, 46 thousand homes were sold in August. This was below expectations of 583,000 sales SAAR, and the previous months were revised down. I'll have more later today. The S&P CoreLogic Case-Shiller U.S. National Home Price NSA Index, covering all nine U.S. census divisions, reported a 5.9% annual gain in July, up from 5.8% the previous month. The 10-City Composite annual increase came in at 5.2%, up from 4.9% the previous month. The 20-City Composite posted a 5.8% year-over-year gain, up from 5.6% the previous month. Seattle, Portland, and Las Vegas reported the highest year-over-year gains among the 20 cities. In July, Seattle led the way with a 13.5% year-over-year price increase, followed by Portland with a 7.6% increase, and Las Vegas with a 7.4% increase. Twelve cities reported greater price increases in the year ending July 2017 versus the year ending June 2017. Before seasonal adjustment, the National Index posted a month-over-month gain of 0.7% in July. The 10-City and 20-City Composites reported increases of 0.8% and 0.7% respectively in July. After seasonal adjustment, the National Index recorded a 0.5% month-over-month increase. The 10-City Composite posted a 0.4% month-over-month increase. The 20-City Composite posted a 0.3% monthover-month increase. All 20 cities reported increases in July before seasonal adjustment; after seasonal adjustment, 17 cities saw prices rise. “Home prices over the past year rose at a 5.9% annual rate,” says David M. Blitzer, Managing Director and Chairman of the Index Committee at S&P Dow Jones Indices. “Consumers, through home buying and other spending, are the driving force in the current economic expansion. While the gains in home prices in recent months have been in the Pacific Northwest, the leadership continues to shift among regions and cities across the country. Dallas and Denver are also experiencing rapid price growth. Las Vegas, one of the hardest hit cities in the housing collapse, saw the third fastest increase in the year through July 2017. The Composite 10 index is off 6.3% from the peak, and up 0.4% in July (SA). The Composite 20 index is off 3.5% from the peak, and up 0.35% (SA) in July. The National index is 3.8% above the bubble peak (SA), and up 0.5% (SA) in July. The National index is up 40.3% from the post-bubble low set in December 2011 (SA). The Composite 10 SA is up 5.2% compared to June 2016. The Composite 20 SA is up 5.8% year-over-year. The National index SA is up 5.9% year-over-year. Note: According to the data, prices increased in 17 of 20 cities month-over-month seasonally adjusted. • At 9:00 AM ET: S&P/Case-Shiller House Price Index for July. The consensus is for a 5.9% year-over-year increase in the Comp 20 index for July. • At Early: Reis Q3 2017 Apartment Survey of rents and vacancy rates. • At 10:00 AM ET: New Home Sales for August from the Census Bureau. The consensus is for 583 thousand SAAR, unchanged from 571 thousand in July. • At 10:00 AM: Richmond Fed Survey of Manufacturing Activity for September. Texas factory activity continued to increase in September, according to business executives responding to the Texas Manufacturing Outlook Survey. The production index, a key measure of state manufacturing conditions, edged down to 19.5 from 20.3 in August, indicating output grew at about the same pace as last month. Other measures of current manufacturing activity also indicated continued growth. The new orders index increased and the growth rate of orders index ticked down but stayed positive, coming in at 18.6 and 9.7, respectively. The capacity utilization index edged up four points to 15.8, while the shipments index jumped nine points to 27.4. Perceptions of broader business conditions improved in September. The general business activity index increased to 21.3, its highest reading in seven months. The company outlook index posted its 13th consecutive positive reading, jumping nine points to 25.6. Labor market measures suggested faster employment growth and longer workweeks this month. The employment index came in at 16.3, its highest level since April 2014. Twenty-eight percent of firms noted net hiring, compared with 11 percent noting net layoffs. The hours worked index rose four points to 18.4. The regional reports released so far for September have been solid. The year-over-year increase in this index has been about the same for the last year (in the 5% and 6% range). Note that house prices are above the bubble peak in nominal terms, but not in real terms (adjusted for inflation). Case-Shiller for July will be released tomorrow. Chicago Fed "Index points to slower economic growth in August"
Led by declines in production-related indicators, the Chicago Fed National Activity Index (CFNAI) moved down to –0.31 in August from +0.03 in July. Two of the four broad categories of indicators that make up the index decreased from July, and two of the four categories made negative contributions to the index in August. The index’s three-month moving average, CFNAI-MA3, decreased to –0.04 in August from a neutral reading in July. This suggests economic activity was close to the historical trend in August (using the three-month average). • At 8:30 AM ET, Chicago Fed National Activity Index for August. This is a composite index of other data. • At 10:30 AM, Dallas Fed Survey of Manufacturing Activity for September. From CNBC: Pre-Market Data and Bloomberg futures: S&P 500 are up 3, and DOW futures are up 35 (fair value). Oil prices were up over the last week with WTI futures at $50.60 per barrel and Brent at $56.83 per barrel. A year ago, WTI was at $45, and Brent was at $47 - so oil prices are up 10% to 20% year-over-year. Here is a graph from Gasbuddy.com for nationwide gasoline prices. Nationally prices are at $2.55 per gallon - up sharply due to Hurricane Harvey, but now declining - a year ago prices were at $2.20 per gallon - so gasoline prices are up 35 cents per gallon year-over-year. The key economic report this week is New Home sales for August on Tuesday. Other key indicators include the third estimate of Q2 GDP, and July Case-Shiller house prices. 8:30 AM ET: Chicago Fed National Activity Index for August. This is a composite index of other data. 10:30 AM: Dallas Fed Survey of Manufacturing Activity for September. 9:00 AM ET: S&P/Case-Shiller House Price Index for July. This graph shows the nominal seasonally adjusted National Index, Composite 10 and Composite 20 indexes through the June 2017 report (the Composite 20 was started in January 2000). The consensus is for a 5.9% year-over-year increase in the Comp 20 index for July. Early: Reis Q3 2017 Apartment Survey of rents and vacancy rates. 10:00 AM ET: New Home Sales for August from the Census Bureau. This graph shows New Home Sales since 1963. The dashed line is the July sales rate. The consensus is for 583 thousand SAAR, unchanged from 571 thousand in July. 10:00 AM: Richmond Fed Survey of Manufacturing Activity for September. 8:30 AM: Durable Goods Orders for August from the Census Bureau. The consensus is for a 1.5% increase in durable goods orders. 10:00 AM: Pending Home Sales Index for August. The consensus is for a 0.1% decrease in the index. 8:30 AM ET: The initial weekly unemployment claims report will be released. The consensus is for 270 thousand initial claims, up from 259 thousand the previous week. 8:30 AM: Gross Domestic Product, 2nd quarter 2017 (Third estimate). The consensus is that real GDP increased 3.1% annualized in Q2, up from second estimate of 3.0%. 11:00 AM: the Kansas City Fed manufacturing survey for September. Early: Reis Q3 2017 Office Survey of rents and vacancy rates. 8:30 AM: Personal Income and Outlays for August. The consensus is for a 0.3% increase in personal income, and for a 0.1% increase in personal spending. And for the Core PCE price index to increase 0.2%. 9:45 AM: Chicago Purchasing Managers Index for September. The consensus is for a reading of 58.6, down from 58.9 in August. 10:00 AM: University of Michigan's Consumer sentiment index (final for September). The consensus is for a reading of 97.2, unchanged from the preliminary reading 97.6. For Q2 2017, the Net Equity Extraction was a positive $12 billion, or a positive 0.3% of Disposable Personal Income (DPI) . The Fed's Flow of Funds report showed that the amount of mortgage debt outstanding increased by $64 billion in Q2. The Flow of Funds report also showed that Mortgage debt has declined by $1.23 trillion since the peak. This decline is mostly because of debt cancellation per foreclosures and short sales, and some from modifications. There has also been some reduction in mortgage debt as homeowners paid down their mortgages so they could refinance. With a slower rate of debt cancellation, MEW will likely be mostly positive going forward. At this point, the S&P500 is up 10.1% under Mr. Trump compared to up 32.2% under Mr. Obama for the same number of market days. The Federal Reserve released the Q2 2017 Flow of Funds report today: Flow of Funds. The net worth of households and nonprofits rose to $96.2 trillion during the second quarter of 2017. The value of directly and indirectly held corporate equities increased $1.1 trillion and the value of real estate increased $0.6 trillion. The Fed estimated that the value of household real estate increased to $23.8 trillion in Q2. The value of household real estate is now above the bubble peak in early 2006 - but not adjusted for inflation, and this also includes new construction. In Q2 2017, household percent equity (of household real estate) was at 58.4% - up from Q2, and the highest since Q1 2006. This was because of an increase in house prices in Q2 (the Fed uses CoreLogic). Note: about 30.3% of owner occupied households had no mortgage debt as of April 2010. So the approximately 50+ million households with mortgages have far less than 58.4% equity - and about 2.8 million homeowners still have negative equity. Mortgage debt increased by $64 billion in Q2. Mortgage debt has declined by $1.23 trillion from the peak. Studies suggest most of the decline in debt has been because of foreclosures (or short sales), but some of the decline is from homeowners paying down debt (sometimes so they can refinance at better rates). The value of real estate, as a percent of GDP, was up in Q2, and is above the average of the last 30 years (excluding bubble). However, mortgage debt as a percent of GDP, continues to decline. According to Black Knight's First Look report for August, the percent of loans delinquent increased 0.7% in August compared to July, and declined 7.3% year-over-year. The percent of loans in the foreclosure process declined 3.3% in August and were down 27.2% over the last year. Black Knight reported the U.S. mortgage delinquency rate (loans 30 or more days past due, but not in foreclosure) was 3.93% in August, up from 3.90% in July. The percent of loans in the foreclosure process declined in August to 0.76%. The number of delinquent properties, but not in foreclosure, is down 148,000 properties year-over-year, and the number of properties in the foreclosure process is down 142,000 properties year-over-year. CoreLogic® ... today released its Q2 2017 home equity analysis which shows U.S. homeowners with mortgages (roughly 63 percent of all homeowners) have seen their equity increase by a total of 10.6 percent year over year, representing a gain of $766 billion since Q2 2016. Additionally, homeowners gained an average of $12,987 in equity between Q2 2016 and Q2 2017. Western states led the equity increase with Washington homeowners gaining an average of approximately $40,000 in home equity and California homeowners gaining an average of approximately $30,000 in home equity. Home price increases in these states drove the equity gains. From Q1 2017 to Q2 2017, the total number of mortgaged residential properties with negative equity decreased 10 percent to 2.8 million homes, or 5.4 percent of all mortgaged properties. Year over year, negative equity decreased 21.9 percent from 3.6 million homes, or 7.1 percent of all mortgaged properties, from Q2 2016 to Q2 2017. This graph shows the distribution of home equity in Q2 2017 compared to Q1 2017. For reference, about five years ago, in Q3 2012, almost 10% of residential properties had 25% or more negative equity. A year ago, in Q2 2016, there were 3.6 million properties with negative equity - now there are 2.8 million. A significant change. In the week ending September 16, the advance figure for seasonally adjusted initial claims was 259,000, a decrease of 23,000 from the previous week's revised level. The previous week's level was revised down by 2,000 from 284,000 to 282,000. The 4-week moving average was 268,750, an increase of 6,000 from the previous week's revised average. This is the highest level for this average since June 4, 2016 when it was 269,500. The previous week's average was revised down by 500 from 263,250 to 262,750. The dashed line on the graph is the current 4-week average. The four-week average of weekly unemployment claims increased to 268,750. The report includes the reference period (includes the 12th of the month) for the September employment report - and suggests there was some impact of the hurricanes on employment in September. Mortgage rates rose today following the announcement and--more importantly--the Fed's updated economic projections. ... Investors weren't sure how the past few months of economic data and events would affect the rate hike outlook. As it turned out, the Fed is more optimistic than investors anticipated. That means they're more willing stick with the previous rate hike outlook for 2017 and 2018, and those rate hike expectations have a direct bearing on today's interest rates. Conventional 30yr fixed rates didn't spike in any brutal sort of way, but given that the past 2 weeks have already seen a somewhat abrupt increase in rates, today still managed to be unpleasant. 4.0% is now the most prevalently-quoted conventional 30yr fixed rate on top tier scenarios. It had shared the stage with 3.875% roughly equally until today. That leaves today's rates at the highest levels in nearly 2 months. • At 8:30 AM ET, The initial weekly unemployment claims report will be released. The consensus is for 303 thousand initial claims, up from 284 thousand the previous week. • Also at 8:30 AM, the Philly Fed manufacturing survey for September. The consensus is for a reading of 18.0, down from 18.9. • At 9:00 AM, FHFA House Price Index for June 2017. This was originally a GSE only repeat sales, however there is also an expanded index. • At 12:00 PM, Q2 Flow of Funds Accounts of the United States from the Federal Reserve.